Arundel Garden Cottage in Historic District! Jacuzzi Hot Tub! Backyard Putting! Go back in time and experience the solitude of small town life in the shadow of a nationally renowned resort community. Arundel Garden Cottage, built by Leonard Tufts (circa 1920), is located in the Historic District of Pinehurst, only 1 and 1/2 blocks to the famed #2 golf course. Walk to village shops, coffee houses, restaurants and pubs. Featuring a private garden patio Jacuzzi hot tub (seats up to 6)!! This unique vintage home is one of a kind! It has been successfully managed and maintained by it's owners since 1996. We often rent an additional house next door, Cardinal House, for larger parties, weddings, reunions, business conferences, and retreats. Arundel is spacious, tastefully furnished and fully-equipped! Linens/towels and other household necessities are included. Newly renovated bathrooms with large walkin showers. Two spacious and comfortable living areas; a large parlor in the front of the house and an additional family room in the back which flows out to the back yard patio, hot tub, putting area, horse shoe pits and garden! 8 single beds / can make up to 3 kings upon request! Queen size futon in the parlor provides additional sleeping. Come and play! : The kitchen is fully equipped with all new stainless steel appliances and dining seating for 8. Many extras include free wireless internet, an extensive library of books, cable TV (42 in flat screen) in each living room and a stereo with a selection of videos, DVDs and CDs. There is a Foosball table, a piano, and a beautifully hand-carved antique game table with cards, games and puzzles for all ages. What makes it truly special is that the property is registered with the National Wildlife Federation as a Back Yard Habitat! Enjoy the outdoors on the screened in front porch or in the privacy of your own luxurious garden patio hot tub. There is a gas and a charcoal grill and ample seating for relaxing and entertaining. Many outdoor activities include a yard for practicing your putting, playing horse shoes or corn hole, bicycling, a vegetable/herb/flower garden with water features, hammock, tree swing, and bonfire pit. There is plenty to do for everyone in your party! Additional services can be arranged in advance including grocery shopping prior to arrival, daily maid service or a mid-stay clean, babysitting, catering for special parties or hire your own private chef! We can forward golf information including links to area courses and telephone numbers to pro shops so that you can arrange tee times prior to your stay! Area activities: If you feel compelled to leave the cottage, stroll up to the village center or bicycle through the quaint historic neighborhood (2 town bikes are provided)! Enjoy a shady walk through Pinehurst's Arboretum or hike through the nature trails in Rassie Wicker Park just mins from your front door! Get a soaking on hot summer days at Pinehurst's new Splash Park, open to all ages! Visit the spectacular Sandhills Horticultural Gardens or the lake at Southern Pines Reservoir Park for boating and hiking. Play golf to your hearts content or attend equestrian events, visit pottery shops in Seagrove, go antiquing in nearby Cameron, shop in the unique historic village of Southern Pines. For those seeking a 'soothing' experience, indulge yourself with a visit to the Pinehurst Spa with it's incredible baths, a pool, a fitness room and your choice of irresistible massages, facials, manicures and pedicures. David and I moved to Pinehurst in 1983. We liked it so much that we decided to make it our permanent home. We raised our family here and even after being empty nesters we continue to enjoy the charm and friendliness of our unique community! We wouldn't live anywhere else! Dave and I were lucky enough to find and purchase Arundel Cottage as our first home. Over the years we renovated, landscaped and restored it’s 'Olde Town' charm. In 1996 we built a new house, 'Cardinal House', on the adjacent lot. We then furnished and equipped Arundel as an affordable vacation rental home for travelers wanting to experience the Sandhills region of Central North Carolina. We have since managed and maintained the home ourselves with our quests comfort and convenience in mind. We have thoroughly enjoyed sharing our unique cottage over the years. We have made many new friends. Some of our guests find they don't want to leave and continue to return year after year. We have built another new home 'Par 3' where we now reside and 'Cardinal House' is also now a vacation home as well. Short walk to the famed Pinehurst Hotel/Spa and Resort! Two 12 cup coffee makers. Over 40 golf courses within driving distance. Short drive to several championship courses! Fully equipped kitchen, ceiling fans, beautiful GARDEN PATIO HOT TUB, piano, game room, foosball table, video/audio/literary library, bicycles, patio, vegetable/flower garden, screened porch, putting area, corn hole, swing and hammock, and good old fashioned 'southern hospitality'. Adorable cottage in quiet neighborhood. I was quite pleased with this cottage, it was large enough to accommodate the guests as well as visiting relatives. There was enough space for all to gather or spread out for a little down time. The piano was a real treat as my daughters boyfriend is a classical trained pianist. If the need arises in the future we will definitely book again. We really enjoyed time here with our family. David and Susan were kind and accommodating. Very clean, very quaint. Has everything one needs. Very nice and great for our needs. Property as described. Perfect for 8 guys. Nice instructions, etc. Plenty of towels, kitchenware. We totaled 8 golfers from CT, MD, DE & NC for this year's annual golf trip. Everyone agreed this was one of the best venues we have had over the past 17 years. Both Susan & Dave were great and did go that extra step to make our stay perfect. We enjoyed a month long stay at the cottage during our most recent trip to Pinehurst. The property has 3 bedrooms and a pull out futon and could easily sleep 9, if not more. There is a large garden that was stocked with tons of stuff, a swing, hot tub, hammock, and plenty of parking. The house is an older house, but the bathrooms have been updated which is refreshing after a hot day of golf, pool or at the beach. The house is right across the street from an elementary school which has a neat playground for the little ones. We were close enough that we walked to the village for ice cream nearly every day. Very pleasant!! The hosts live two doors down and were always available. We did have a water pipe issue during our stay, but that stuff is going to happen regardless of where you stay. The owners were quick to jump on getting a repair person in as soon as possible which is call we could ask. The only negative is that the WIFI does not for allow for much data to come across so using the internet for actual work stuff (downloads, printing, etc) was a slow haul, but hopefully this is improved on for our next visit. We actually had better luck using our phones as hot spots which at least helped things. Stroll up to the village shops, restaurants, and pubs! Bicycle through the historic village! Visit the famed Pinehurst Hotel and Spa! 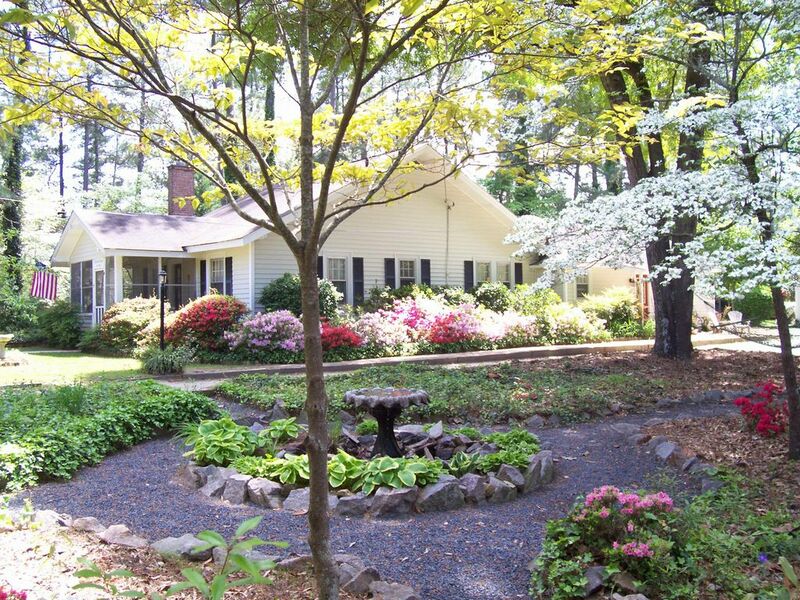 Stroll through Pinehurst's Arboretum! Walk through the nature trails in Rassie Wicker Park just mins from your front door! Enjoy a refreshing soak in Pinehurst's new Splash Park! Visit the spectacular Horticultural Gardens! Play golf to your hearts content or attend equestrian events, visit pottery shops, go antiquing in nearby Cameron, shop in the unique historic villages of Pinehurst and Southern Pines. Golf: The home is minutes to many of the championship golf courses. David and Susan have lived in Pinehurst for 25 years and know the area well. Recommendations and information about the area golf courses can be provided in advance. Just ask! They'll be glad to help you!